Who owns your business's Google+ Page and YouTube channel? When consumer Google+ shuts down on April 2, 2019, all Google+ Pages and their content will be deleted. This will NOT affect your YouTube channel or the underlying Brand Account. Make sure to download a copy of your Google+ Page's data before April. Learn how to save your data. This will not affect your YouTube channel or your YouTube channel's Brand Account. Are you the owner of your business's YouTube channel and Google+ Page? Creating and maintaining a YouTube channel, Google+ Page and other social media profiles can require a significant investment in time, energy and expertise. It's natural that many business owners often delegate social media management to hired experts, employees, or even interns. But what business owners often don't appreciate is that having someone else create your accounts can mean losing control if that employee quits, is fired, or doesn't keep a record of the account's username and password. So how can a business owner ensure that they retain access to their YouTube channel and Google+ Page? I'm not the owner of my business's Google+ Page and YouTube channel - what can I do? and YouTube Help Forum we see many pleas for assistance from business owners who desperately need to gain access to their channel or page, but cannot because they can't sign in to the Google Account that owns it. If an employee (or intern or friend) creates the account using their own personal email and information, and will not - or cannot - give the business owner access, there is usually nothing the business owner can do to claim it. From Google's perspective, the creator of the account is the true owner of the account. Fortunately, Google offers a solution. You as the owner of the business should control the Google Account that owns your company's Google+ Page and YouTube channel. You can then add managers who can post content, moderate comments and manage the appearance of your profiles. If you are hiring someone to create a Google+ Page and YouTube channel for your business, make sure that you are the owner - and control the email username - of the Google account and Google+ Profile they create. Note: you do not need a Google+ Profile to manage a YouTube Channel or Google+ Page for your business. You do need a Google Account. The advantage of using an email address on your business's domain is that you should always be able to control access to that email account and reset the password if necessary. If your business re-brands and changes its domain, the email username on the Google account can be updated. If you do choose to add a Gmail email address to your Google account, keep in mind that the Gmail address will be the username and primary email for the account. If you don't know your account's Gmail email address, you won't be able to sign in or recover access to the account. Note: as of July 2014 a Google+ Profile is not required to be a personal name. Note: as of November 2015 it is no longer necessary to have a Google+ Profile to become a manager of a Google+ Page. You can be Owner of the Page without any public Profile identity. Google+ Profile names policy recommends that your profile represent you as an individual. The profile doesn't have to use your full legal name. It can be your first name and last initial, for example (like "Peggy K"). I think it is best practice to keep Profiles personal, and have a Page represent your business. That way your Page can be managed by people who don't have "Owner" access. Also be sure to enter your own birth date, rather than your company's creation date. You don't want your account to be restricted because your business isn't 18 years old! If you don't plan to use the Google+ Profile, you can change the settings so that the profile doesn't appear in Google's search results (plus.google.com/settings >Help others discover my profile in search results) . You can also choose to not have any public Google+ Profile at all. Google+ Pages and Brand Accounts can be managed at myaccount.google.com/brandaccounts which does not require a Google+ Profile. 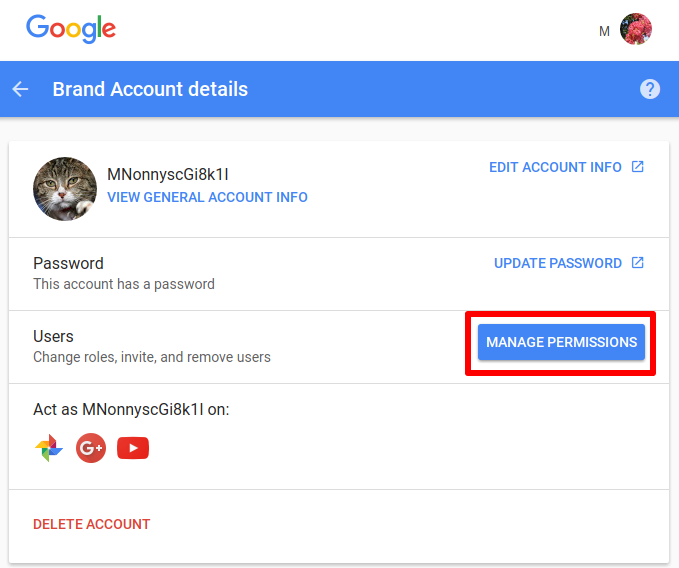 If your Google account and it's YouTube channel, photos, Blogger blogs, Google Drive documents and Google+ Page are important to you, you will want to be sure the account recovery options are up to date. If your account's username is a Gmail email, you can add a non-Gmail password recovery email address. This should be an email account that you will have long-term access to - preferably an email on your business domain. You also can add a mobile phone number to your account for recovery purposes. Update February 2017: Both YouTube channels and Google My Business listings are now separate from Google+, and each can be created independently on a Brand Account. 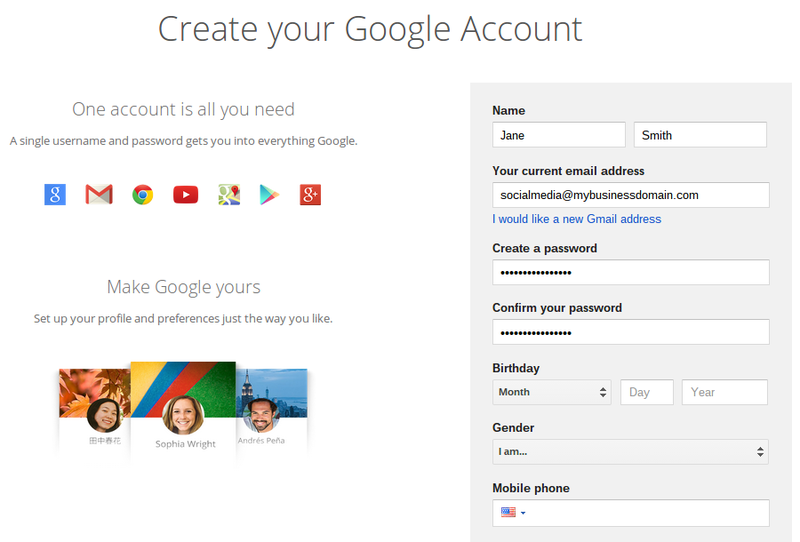 You can manage all your Brand Accounts at myaccount.google.com/brandaccounts. If you have a Local Business that you want to appear on Google Maps, create a Google My Business Listing. Creating a Google My Business listing, Google+ Page, or business YouTube Channel also creates a new Brand Account. If you have an existing Brand Account, you can add a Google+ Page or YouTube channel. So as a business owner, how to you make sure you maintain your ownership of your Google+ Page and YouTube channel without having to manage them yourself? If you are going to have an employee or social media manager post content and moderate comments, what you should do is add their Google Account as a manager of your Google+ Page or YouTube Channel's Brand Account. As the owner, only you will be able to add and remove managers or delete the Google+ Page and YouTube channel. Your manager can do everything else. A communications manager can only make posts on Google+ and moderate and reply to comments. Communication managers have limited access to YouTube. A full manager can also edit your profiles, post videos to YouTube, or run a Hangout on Air. There can be up to 50 managers for a Google+ Page. Just make sure you only add managers you can trust! If the employee managing your Google+ Page and YouTube channel quits, or you choose to change social media management companies, their access can be quickly and easily revoked. My Google Account isn't the owner of my business's Google+ Page and YouTube channel - what can I do? If you've read through this and come to the realization that you aren't the owner of your business's Google+ Page and YouTube channel, then that can be remedied. Hopefully you know who that person is and they can remember how to sign into their account! The managers of Google+ Pages and YouTube channels are not publicly visible (by design) and there is no way to request that information from Google. Click the blue "Manage Permissions" button. That will show you the names of all the Brand Account's owners and managers. If you don't know which Google Account owns your business's Google+ Page and YouTube channel, you unfortunately don't have many options. Hopefully the owner of the Google+ Page will receive an email notification and respond. 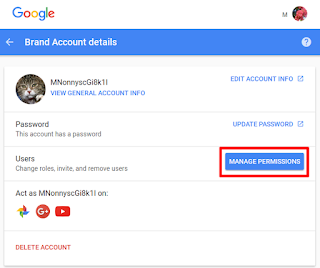 If your Google Account has been a manager of the Google+ Page or YouTube channel's Brand Account for at least 2 weeks 24 hours, the current owner of the Brand Account can transfer ownership to you. Note that transferring ownership of a Brand Account transfers all the Google services on that account, including the Google+ Page, YouTube channel, Google Photos and Google My Business listing. post a new question in the Google+ Help community. It's possible someone there may have another suggestion you can try to recover your Google+ Page. I don't suggest an impersonation report lightly. Google+ Page removals are permanent, and the connected YouTube channel will be removed as well. Only try that if you have absolutely run out of options. That's why it's so important to make sure you are the owner of your business or brand's Google+ Page from the beginning! Note that there may be other recovery options if you have lost access to a verified Google My Business location. 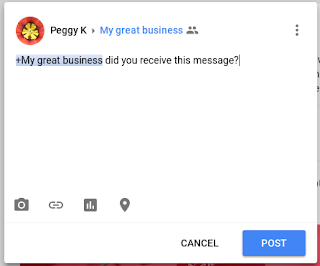 Post in the official Google My Business help forum for assistance with local business listings. That's why it's so important to make sure you are the owner of your business or brand's Google+ Page and YouTube channel from the beginning! Also check out this playlist to learn more about creating and managing Google+ Pages and Page-linked channels for your business, organization or brand. Thanks to +Kamal Tailor , +Kaleh Kohler, +Jaana Nyström, +The Lady from Uncle and many others for discussion and suggestions that went into this post! Top photo: "Home market :1941" shared by Don O'Brien on Flickr under a CC by 2.0 license, text added by me. Updated 1/3/16 with updated screenshots and Google My Business dashboard details. Updated 3/8/18 to add video tutorial links. Very helpful and concise article, thank you. Excellent resource Peggy! Thank you for sharing. Hope all are well. Please help me on this regard.. I have a listing with 33 reviews and a good no of viewer. I forgot the id and password of the related account. What can Do?? ?